Sunflower Sampler pattern. This beautiful Sunflower Sampler is back by popular demand! 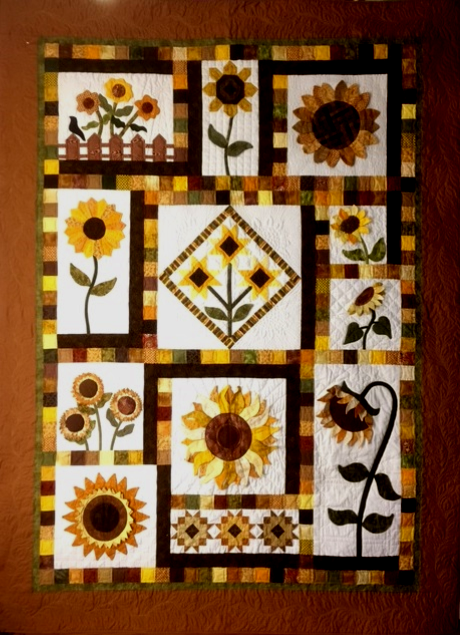 This project includes many different techniques in making sunflowers—traditional applique, blanket-stitch applique, old fashioned piecing, strip piecing, 3-dimensional fabric manipulation, paper-piecing, etc. It is a “sampler” of techniques used to make the blocks. Any of the applique pieces that are not 3-Dimensional can be stitched with your favorite method of applique (needle turn, fusible, buttonhole, etc.) and can be either machine stitched or by hand. The quilt finishes 64" x 86".